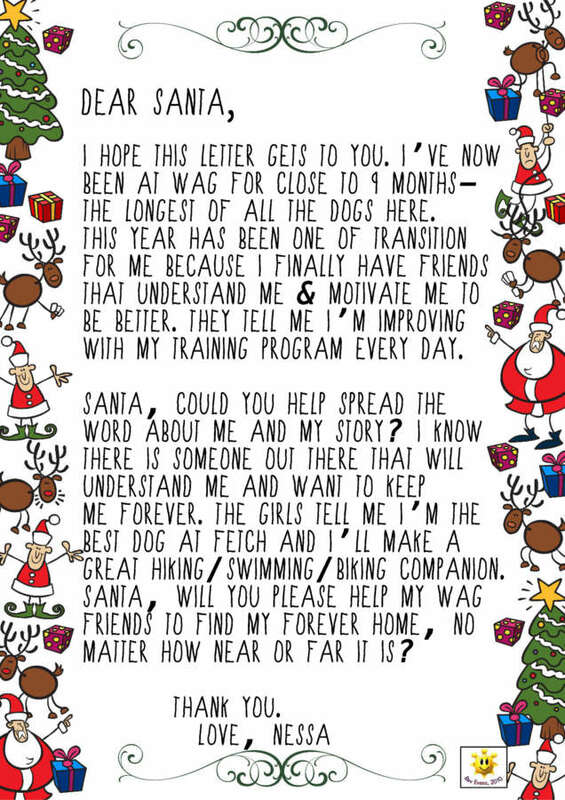 With Santa starting his around-the-world trip, our long term animals that are in the shelter asked us to help them with their letters to Santa. They love the volunteers that come in to walk them, cuddle them, and play with them, but it seems like they’d each like to find their homes where they get to be the centre of their family’s attention. All of these animals have been in our care for a minimum of a month, ranging up to nine months. We have some cats that have been with us for even longer, but they were in their foster homes today and not able to write letters with us. For the staff’s Christmas wish, we hope that some of you will share these letters so we ensure that Santa gets their messages. If you visit our Facebook page, you will also find each individual letter for easier sharing. Be warned, some of these made us cry so you might need a tissue! Merry Christmas everyone, and thank you for your continued support of WAG.